The bear market since 2007 was devastating for stockholders. A large bounce followed bringing with it a new sense of optimism, a feeling that this was just a temporary setback with a recovery ahead. This mentality is far from the truth however; expect much lower share prices in the coming years. A major high in the price of stocks occurred in early August of 1720, it was the peak of what is now know as the South Sea Bubble. Stock prices lost the vast majority of their value in the crash that followed. 1929 was also a substantial top. Since 1932, the bottom of the market during the Great Depression that followed, a 5 wave pattern can be seen that ended just a few years ago (not shown). It is the same 5 wave pattern that can be seen since the low following 1720, but on a smaller scale. What is so interesting is that both of these 5 wave patterns completed a few years ago, that is the advance since 1932 was the 5th or final wave of a larger 5 wave advance since the low just after 1720. In Elliott Wave Theory a 5 wave pattern, like one that was mentioned above, is called an impulse wave and is always followed by a corrective wave. The correction is only a partial retracement of the previous impulse. Although the percentage retracements are similar, the larger the impulse, the larger the decline in nominal terms. Degrees denote the size of the waves. So an impulse since 1932 means there will be a drastic correction in the price of stocks. It turns out that correction would be of the same degree as the decline during the great Depression itself. 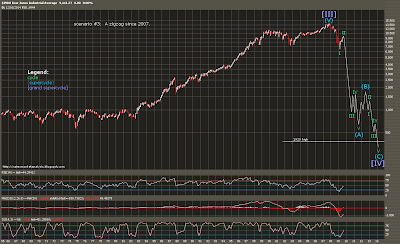 This is bad enough, but remember there is also a 5 wave impulse following the low after the South Sea Bubble of 1720. This means the decline coming is of greater degree than that seen during the Great Depression. It will be a piece of history that will be read about centuries from now just as we read about the South Sea Bubble today. This is hard to swallow but it is something that Robert Prechter has talked about in many books and publications. Robert Prechter founded Elliott Wave International. Some writings from that organization are available on the right column of this page. I highly recommend their material. Without going into further details, the statements above will be assumed as fact. The decline that is ahead is of grand supercycle degree, it is correcting the market gains since the low just after 1720. It is believed that wave [III] topped in 2000 or 2007. This means there will be a 3 supercycle wave correction down from the top, 2 waves down, 1 wave up. 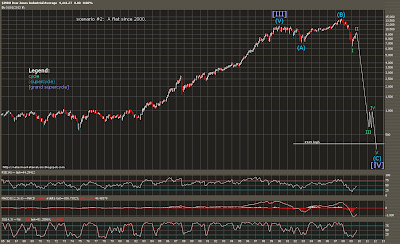 Because the date of the top is not known for certain (although 2000 is the most likely) and the structure has not fully played out, one of several formations can be expected as depicted on 1 month Dow 30 log scale bar charts below. If a flat of supercycle degree is unfolding, a corrective combination may be playing out as the above two charts illustrate. (W) denotes the flat that is underway. Waves (X) and (Y) have not started but can each be any three (a zigzag triangle, or flat). Many options exist, two are shown above. Notice the market falling below levels not seen since the 1929 high. This is a wave (IV) wave of [III] crossing, a common occurrence for corrections. Please note that the wave termination points shown are only guesses; the point of the above and below charts is to present structure, not exact price or time targets. 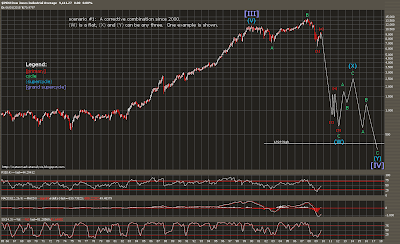 The next chart, above, also assumes a year 2000 wave [III] top, but with a more simple structure in mind. There is only a flat unfolding where each of its waves are of supercycle degree. Notice again that the lower 1920s territory target is still reached. Finally, if the peak of wave [III] was actually seen in 2007, the orthodox top, a zigzag down can be expected that again reaches a level lower than the 1929 peak. Other formations do exist but are not as desirable. For example, suppose the top occurred in 2000 with supercycle degree flat completing March 2009 following that top. The flat is proportioned much better on a price scale, but the rally since March has been very brief compared to the time the (W) wave flat took to complete. In addition a fairly clear double zigzag has unfolded, a complex pattern that is probably not forming a higher complexity. A double zigzag can form the 'a' wave of a larger flat or triangle formation, however. On the other hand, the market is at a bullish extreme, something that is typical of a market top. So a forming or formed (X) wave is possible but not desirable. A larger correction that contains one of the formations above is another possibility. This would be a massive structure taking many years to complete. A large decline should still be expected however. The market consensus is a very bullish one at the moment. In fact, according to the DSI and BPSPX as seen on stockcharts.com, there are more bulls now than there were during the peak of the market in 2007. To have this sort of bullishness and continued optimism at such a low market price is very bearish for stocks, in fact it's all the markings of a second wave. There is doubt that there ever was a problem, at least not on that cannot be easily solved. So it appears the market is destined for much lower prices in the form of some sort of 3rd wave as all the above charts show. After that wave bottoms and the following 4th and 5th complete, several options are possible at that point. Price levels will be an important factor in determining probable market direction. During corrections, the market typically finds support in the 4th wave of the impulse of higher degree or the 2nd wave of the 5th wave of higher degree if the 5th wave extended. The 5th wave did extend (the wave since 1932) but since the 2nd of the 5th of one higher degree is not higher than the peak seen in 1929, some level seen before 1929 should act as support. There is no requirement that these waves will cross, but that is what is typically seen. 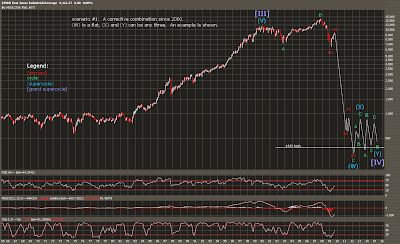 Note also the impulse since 1932 had its 4th wave occur in the 1970s with the 5th following that. The 2nd of this 5th was below the 2000 point level on the Dow 30. So even if the impulse since 1932 is considered, the market prices should reach at least the 2000 level. But given all that is known, this is a very conservative estimate. Considering the possibilities that lie on the horizon, it is wise to stay out of the way of this bear market.